Auries whaur Serbo-Croatie is spoken bi a plurality o speakers (as o 2005). Serbo-Croatie an aa cried Serbo-Croat, Serbo-Croat-Bosnie (SCB), Bosnie-Croatie-Serbie (BCS), or Bosnie-Croatie-Montenegrin-Serbie (BCMS), is a Sooth Slavic leid an the primar leid o Serbie, Croatie, Bosnie an Herzegovinae, an Montenegro. ↑ 1.0 1.1 Kosovo is the subject o a territorial dispute atween the Republic o Serbie an the sel-proclaimed Republic o Kosovo. The latter declared unthirldom on 17 Februar 2008, but Serbie continues tae claim it as pairt o its awn sovereign territory. Kosovo's independence haes been recognised bi 103 oot o 193 Unitit Nations member states. ↑ "Constitution of the Republic of Kosovo" (PDF). p. 2. Retrieved 2012-08-17. ↑ "B92.net". B92.net. Retrieved 2013-09-01. ↑ "Minority Rights Group International : Czech Republic : Czech Republic Overview". Minorityrights.org. Retrieved 2012-10-24. ↑ "Minority Rights Group International : Macedonia : Macedonia Overview". Minorityrights.org. Retrieved 2012-10-24. ↑ Nordhoff, Sebastian; Hammarström, Harald; Forkel, Robert; Haspelmath, Martin, eds. (2013). "Molise–SKB". Glottolog. Leipzig: Max Planck Institute for Evolutionary Anthropology. ↑ Čamdžić, Amela; Hudson, Richard. 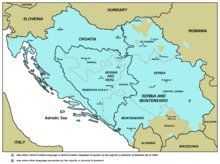 "Serbo-Croat-Bosnian clitics and Word Grammar" (PDF). UCL Psychology and Language Sciences. Retrieved 11 September 2013. This page wis last eeditit on 12 Juin 2016, at 23:27.